Bridgestone Blizzak WS70 tires are among the top of the class for navigating through light snow, deep snow, ice, freezing rain, slush, and other harsh winter weather conditions. They do this without sacrificing a smooth and comfortable ride or excessive road noise. 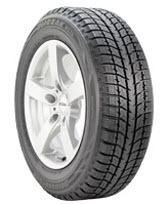 The tire itself features Bridgestone’s unique Nano-Tech Multicell Compound which is silica-enhanced and gives the tread its superior traction in any type of severe winter weather. 3D sipes add more stiffness to the tread blocks and provide better-wet pavement performance. Four deep tread grooves reduce the risk of hydroplaning and channel water away from the tire, while the optimized directional tread width gives optimal contact with the road and provides improved braking. On the inside, Bridgestone uses twin steel belts that are wrapped spirally with nylon for added strength and durability at higher speeds, as well as improving the ride and lifespan of the tread. Overall, we can’t say enough about how well this Bridgestone WS70 performs in the snow and on the ice. You’d be hard-pressed to find a better grip in a snow tire. Ride quality is excellent and the treadwear is good. Prices on the Blizzak WS70 range from around $90 for the 15-inch series to approximately $180 for the larger 18-inch series tires. Below you can find Blizzak WS70 Bridgestone tire discount or you can try other tires discounts here. Who Are Bridgestone Blizzak WS70 Tires Designed For? Bridgestone Tires has designed the Blizzak WS70 for drivers of all types of coupes, sedans, crossovers, and minivans who are looking for the best traction and handling you can find in a snow tire for driving in light or deep snow, ice and other winter weather conditions. Bridgestone Tires does not have a tread life mileage warranty on the Blizzak WS70. You will, however, find a tire uniformity guarantee for the first 2/32 inch of tread wear. Materials and workmanship are backed for 5 years and are simply prorated based on treadwear all the way down to the last 2/32 inch of usable tread on the tire.